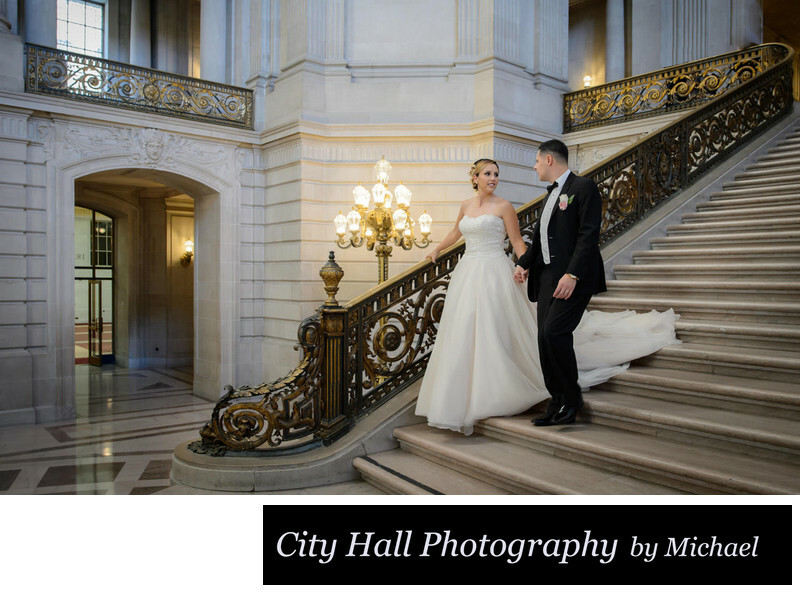 We have learned quite a bit over the years while photographing San Francisco City Hall weddings. As time goes by, we find ourselves providing more and more advice to our couples to make the whole process easier and more enjoyable. With this in mind, we decided it would be useful to share some of our expertise and provide some helpful hints. Allow plenty of time on the day of your wedding to get to S.F. City Hall. Instead of having breakfast or lunch at home, have at in the City Hall cafeteria! The food is great and it gives you just a little more cushion in case things run late. Unexpected city traffic, parking problems and special events are just a few of the things that can make you late to your own wedding. If you arrive too early, you can check out some of the historical information about San Francisco City Hall while you wait for your ceremony time. Avoid stress on your wedding day and plan things out! We have seen more than our share of late brides and grooms on their wedding day. It is especially important to be on time if you have a 3:30 pm ceremony scheduled. The County Clerk's office closes shortly after this final ceremony time and so if you are too late, you risk all of the officiants going home. If you plan on bringing lots of guests ask them to wait by the stairs. This is preferable to having them all follow you to check-in at the County Clerk's office. We definitely notice a rise in the stress level of our brides and grooms when they have to deal with everyone in that small space outside of the clerk's office. The noise level can be crazy and if things are running behind, it just makes the whole process more complicated. Just bring your witness and your wedding photographer. There will be plenty of time for your guests to join you and watch your ceremony. It's also important to educate your guests in advance. Let them know that they won't be missing anything by not following you both to the ceremony check-in. Following this advice also makes it better for other brides and groom checking in by cutting down the crowds in this small space! Be sure to bring water bottles, protein bars or other favorite snacks. 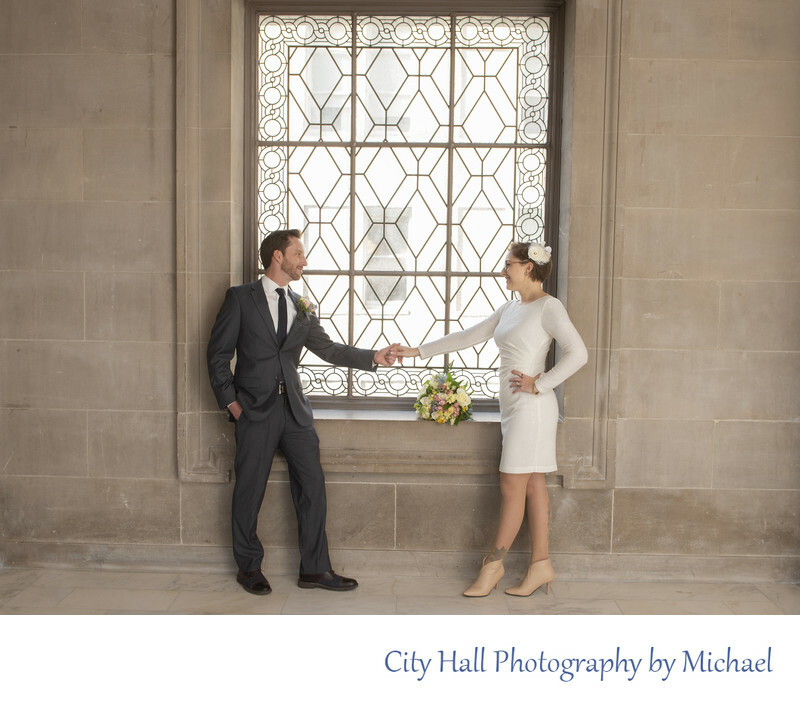 City Hall weddings often run late, especially in the afternoon. Assuming you are going to hire a professional wedding photographer, it's also a good idea to bring some comfortable walking shoes. This will help with all of the walking you will be doing to each photo location. Most wedding photographers will give you plenty of time to change back into your dress shoes. Other items to bring to any courthouse wedding include safety pins, tape, and a sewing kit. The best days to have your civil ceremony are Tuesdays and Wednesdays. Fridays are by far the busiest days followed closely by Thursday. 9:30 am ceremony times are usually not too crowded and we also like the later times. After 4 pm, people start to slowly clear out of City Hall, but there is a slight risk of tour groups and events helping you celebrate your civil union. Overall we still like the late times best! If you book a 3:30 ceremony and it runs typically late, you wont be getting married until closer to 4:00 pm. 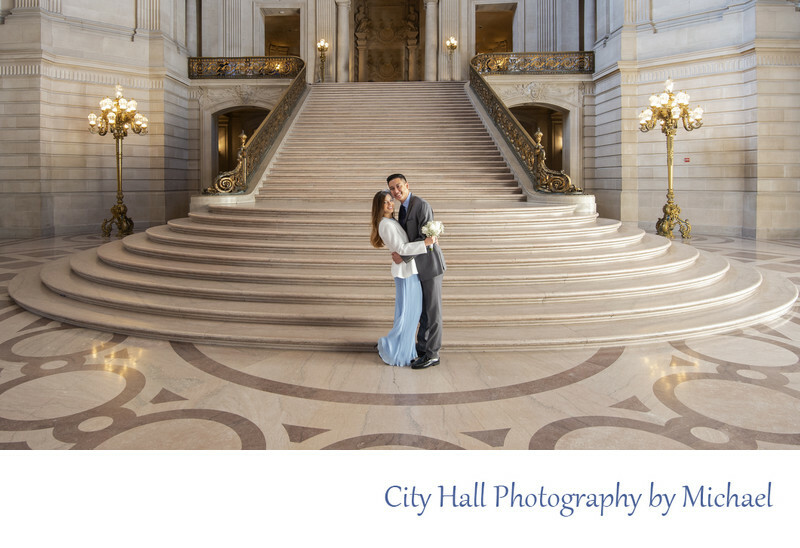 By the time we are ready to take your photos, most of the people will have cleared out of San Francisco City Hall! This will make your whole matrimonial experience more enjoyable and less stressful. To really experience this famous city, consider booking one of our SF Tour Packages. This will allow you and your new spouse the opportunity to see some of San Francisco's most famous sites. Our packages are affordable and we will provide the transportation! We know our way around the city and are happy to provide you with a quasi guided tour! Brides, if possible bring a nice bouquet to your SF City Hall wedding. Flowers provide a nice splash of color to the background and will enhance your wedding pictures. It also gives you something to do with your hands! To return to our San Francisco city hall home page click the link.